"To have less and do more" became my motto almost 8 years ago and resulted in selling my beloved farm in Vermont. The house was a classic post & beam saltbox that had tripled in size over its 100+ years, with bountiful years resulting in additions and double staircases which caused more than one visitor to get lost within the house. The land was the ideal mix of fields and woods and four generations of my Firelight Setters pointed their first grouse and woodcock near the apple trees, alders and stone walls that were out the back door. But owning it required that most days I had to be away to earn the money to support it and I was ready for change. So I sold the farm and took early retirement. Well, okay, "early retirement" is a stretch since I did not meet the age and certainly not the financial criteria normally associated with retirement. Perhaps jumped-ship would be more accurate. They offer both quality and quantity of dog work like no other species as the dogs work the brushy edges of Kansas fields. 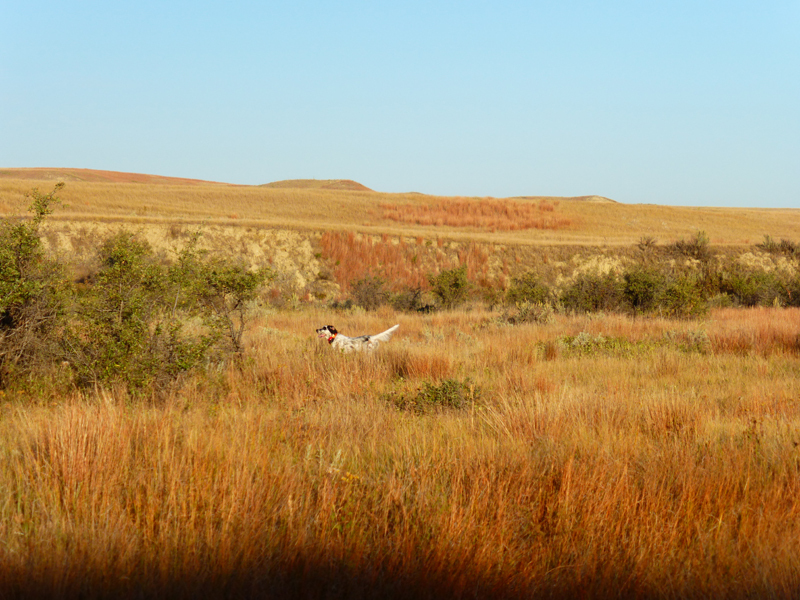 Dog stamina and ability to stay healthy and strong when hunting several hours a day, day-after-day for weeks has crystallized the importance of breeding for both good conformation as well as the intelligence to handle a wide variety of terrain and species. in Michigan and it became clear: You can take the girl out of the North, but you can't take the North out of the girl. I will continue to travel to the prairies and plains for hunting, but the woods where ruffs are found will see more of my time. Which brings me to the past week where I signed a contract to sell my house here in Kansas and soon I will be traveling to northern Michigan in search of my next house. I hope it will become my home, but only time will tell. One thing of which I am certain: Home is somewhere in the North woods.